The first column of both tables shows the names of the birds. The second column of the left-hand table shows the average numbers of those birds across all the gardens. The second column of the right-hand table shows the percentage of all the gardens in which those birds were identified. You can see results from this year's Birdwatch on this page of the RSPB web site. 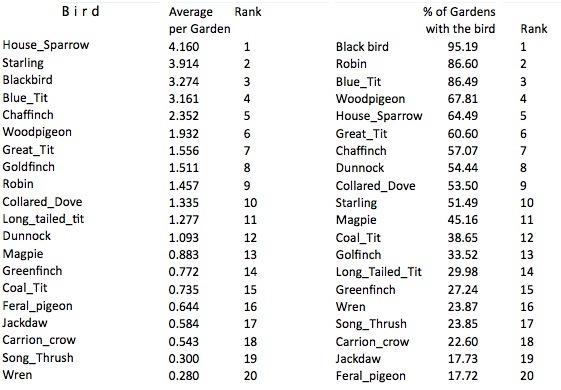 You may need to have a chat with others to get a clear picture of the meanings of "average per garden' and "percentage of gardens with the bird". Have a general look at both tables. What can you say about them? What can you can about the ranking of the starling? What can you say about the ranking of the robin? Representing. Frequency tables and Bar Charts. Experimental probability. Investigations. Interpreting data. Handling data. Processing and representing data. Comparing data. Theoretical probability. Collecting data.